March 9, 2017 – Mister Journalism: "Reading, Sharing, Discussing, Learning"
The promise, the dream of school choice is a system in which every family can choose from a wide range of schools, selecting the one that best fits their own child. If we would just break the public school “monopoly,” the reasoning goes, even poor families would have the same wide range of choices available to upper and middle class families. This is not a true thing. It is not even an accurate portrayal of what the choice debate is really about. First, we know that even in a choice system, choices would be limited. Chris may want to go to a school with a strong left-handed underwater basket weaving program, but if Chris is the only student in a few hundred miles who wants such a program, no school is going to emerge to meet that too-small market demand. The market is going to include many students and families with many desires or preferences for programs and schools, but the market is only going to respond to some of that market. The range of available choices will also be limited. In a traditional public system, the range of choices is handled under one roof. The public school picks and chooses and offers a variety of options based both on what students sign up for and what the school can afford. This can actual serve a student like Chris well– the school may still not have enough students to run a left-handed underwater basket weaving program, but there might be broad enough interest in basket weaving or left-handed crafts that Chris can still get some of the education Chris wants. The public system also has mechanisms in place to allow the market to ask for particular programs. Parents, students and taxpayers can contact their elected board members or administrators either in private as individuals or in pubic at board meetings. They can continue to express support for (or dismay with) current programs within the school, just as students vote with their course registrations for programs to continue or to die. That’s how, for instance, a small rural school in Northwest Pennsylvania ended up with a thriving steel drum band. But ultimately the school’s choices will be limited by demand and by finances. This is the sort of choice that is available to wealthy and, sometimes, middle class families– a school that provides a variety of options and programs under one roof, and which is responsive to the requests or demands of parents, students and taxpayers. The wealthy and middle class have these choices because their schools have money. Fans of choice often suggest that these families choose a wealthy school, but that’s not accurate– these families carry their wealth with them, making whatever school they choose a wealthy one. That means their schools will suffer less from the financial limits that poor schools deal with. What choice proponents propose is a system where a different mechanism decides the choices– private companies, management groups, and investors decide what will be offered. Private companies, management groups and investors will decide which choices will be available to the community, and they’ll do it based on their reading of the market and the financial resources they have available. They will not offer an endless unlimited cornucopia of choices. The selection of choices will be limited, because resource and markets are limited. In fact, a choice system will probably offer a less useful array of choices since they are operated and controlled by people who are not in the community and are generally controlled by opaque management systems (sometimes full states away) who do not offer easy or ready access to parents, students, or taxpayers who want to offer input about the available choices in the system. The choice system can do one thing that a public system can’t– provide options that should not exist in the first place, such as highly segregated all-white schools. 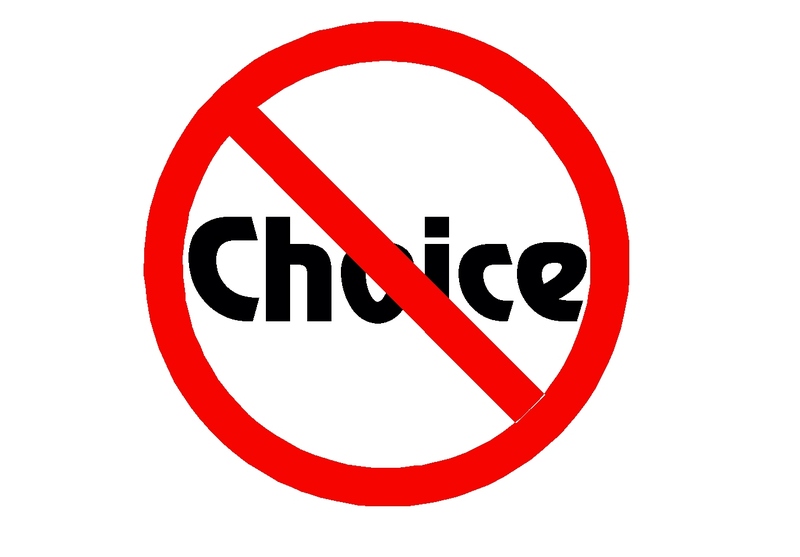 The school choice debate is not a debate about whether or not students and their families will have choices. The debate is about who will decide what those choices are going to be. Either system will only provide limited choices, options that are constrained by finances and demand. Neither a voucher system nor a public school will get Chris a left-handed underwater basket weaving program (though the public system can likely come closer). The traditional public system will provide choices under one roof, selected and provided by the school leaders in collaboration with staff, parents, community and students in a system that is designed to be large transparent. A choice system will provide the choices chosen by the owners and operators of the choice schools. You know which system of governance I favor, and there’s a lot I could say about why. But for purposes of this discussion, I want to make this point– the scope and range and variety of choices available are not determined by the governance model, but by the finances. The more money the system has, the more choices it can offer. Want to provide poor students with the same options available to wealthy students? Pump the same kind of money into poor schools that is going into wealthy schools. Taking money from a single public school and spreading it out over multiple choice school options will not magically turn it into more money, and duplicated costs (like many administrators) will make the money stretch less. It will not provide more choice. It will not provide better choice. What it will do is allow many private operators access to the marketplace where all that sweet, sweet public school tax money flows– but that will not serve students nor their families nor the communities nor the taxpayers. It will not expand choice. It will simply give a different group of people the power to decide which choices will be available– disconnected people, outside people, people with a vested financial interest, people who don’t have to listen to anyone in the school or community. This is not the expansion of choice– it’s the expansion of a market. This debate is not really about school choice, because school choice is not a thing. In an article entitled, Betsy DeVos’ Holy War, Janet Reitman does a thorough job of reporting on and investigating Donald Trump’s Secretary of Education. There are several West Michigan sources cited in the article, like the President of the Acton Institute, Rev. Robert Sirico, along with some community organizers and Grand Rapids School Board member and a local public school teacher. Reitman cites lots of good background material, such as the book Amway, the Cult of Free Enterprise and Russ Bellant, who has been tracking the religious and political right in the US and Michigan for almost 30 years. New Article Published on Using Value-Added Data to Evaluate Teacher Education Programs | VAMboozled! Source: New Article Published on Using Value-Added Data to Evaluate Teacher Education Programs | VAMboozled!